This chapter presents one of Python’s most useful built-in types, lists. You will also learn more about objects and what can happen when you have more than one name for the same object. Since lists are mutable, it is often useful to make a copy before performing operations that modify lists. As the loop runs, total accumulates the sum of the elements; a variable used this way is sometimes called an accumulator. 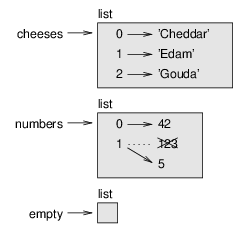 Most common list operations can be expressed as a combination of map, filter and reduce. As usual, the slice selects all the elements up to but not including the second index. We know that a and b both refer to a string, but we don’t know whether they refer to the same string. There are two possible states, shown in Figure 10.2. So the state diagram looks like Figure 10.3. Until now, we have been using “object” and “value” interchangeably, but it is more precise to say that an object has a value. If you evaluate [1, 2, 3], you get a list object whose value is a sequence of integers. If another list has the same elements, we say it has the same value, but it is not the same object. The state diagram looks like Figure 10.4. The parameter t and the variable letters are aliases for the same object. The stack diagram looks like Figure 10.5. It is important to distinguish between operations that modify lists and operations that create new lists. For example, the append method modifies a list, but the + operator creates a new list. The return value from append is None. The result of the operator is a new list, and the original list is unchanged. The slice operator creates a new list and the assignment makes t refer to it, but that doesn’t affect the caller. At the beginning of bad_delete_head, t and t4 refer to the same list. At the end, t refers to a new list, but t4 still refers to the original, unmodified list. Most list methods modify the argument and return None. This is the opposite of the string methods, which return a new string and leave the original alone. Before using list methods and operators, you should read the documentation carefully and then test them in interactive mode. In this example you could also use the built-in function sorted, which returns a new, sorted list and leaves the original alone. You can download solutions to these exercises from http://thinkpython2.com/code/list_exercises.py. This exercise pertains to the so-called Birthday Paradox, which you can read about at http://en.wikipedia.org/wiki/Birthday_paradox. You can download my solution from http://thinkpython2.com/code/birthday.py. Because the words are in alphabetical order, we can speed things up with a bisection search (also known as binary search), which is similar to what you do when you look a word up in the dictionary. You start in the middle and check to see whether the word you are looking for comes before the word in the middle of the list. If so, you search the first half of the list the same way. Otherwise you search the second half. Write a function called in_bisect that takes a sorted list and a target value and returns True if the word is in the list and False if it’s not. Or you could read the documentation of the bisect module and use that! Solution: http://thinkpython2.com/code/inlist.py. Two words are a “reverse pair” if each is the reverse of the other. Write a program that finds all the reverse pairs in the word list. Solution: http://thinkpython2.com/code/reverse_pair.py. Two words “interlock” if taking alternating letters from each forms a new word. For example, “shoe” and “cold” interlock to form “schooled”. Solution: http://thinkpython2.com/code/interlock.py. Credit: This exercise is inspired by an example at http://puzzlers.org.